Paper prescriptions can be written and printed in Open Dental. In the Chart Module toolbar, click New Rx. Alternatively, in the RX Manage window, click New Rx. Rx / Prescriptions List: Add new medications to the Prescriptions list. Create templates for common prescriptions and set up drug interaction alerts based on allergies, medications, and/or problems. Rx Layout: Customize the print layout when printing one prescription on a page. 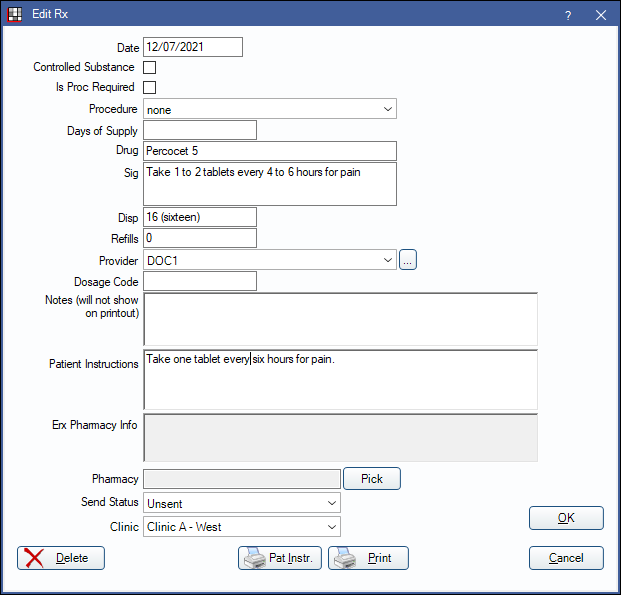 Rx Multiple Layout: Customize the print layout when printing up to four prescriptions per page. Rx Manage: Create and manage prescriptions and/or print multiple prescriptions per page. In the Select Prescription window, double-click on a prescription template that is close to your requirements, or click Blank to start with an empty prescription. The Blank button is not available if EHR is turned on. (Optional) If the prescription list is long, filter the list using the Search. Controlled Only: Check this box to only display prescriptions marked as a controlled substance. Click Search or press Enter to refresh the list. Note: If Prescription Alerts are triggered, a pop up will display the alert message. Click Cancel to select a different prescription template. Click OK to proceed. Enter or change prescription information as needed. Is Proc Required: Check this box to require an associated procedure when printing. Select a procedure from the dropdown. See Procedure Required on Prescription section below for setup. Procedure: Select the procedure requiring the prescription. Use the dropdown menu to select from completed or treatment planned procedures. Days of Supply: Required by some states. Enter the number of days this prescription will last. Can be a partial day if needed (e.g. 3.5). Also available as an output text field on Rx / Single Prescription Layout sheets. Sig: Instructions for the patient on when and how to take the prescription. Refills: Number of refills allowed. Provider: Provider filling the description. Dosage Code: Only visible when EHR is turned on. Notes: This is only for your use and does not appear on printed prescriptions. Patient Instructions: Provide instructions to the patient on how the medication should be taken. eRx Pharmacy Info: Informational field that automatically populates with the pharmacy name when electronic prescriptions are received. This helps verify the correct clinic is selected. Pharmacy: Click Pick to select a pharmacy from the Pharmacies if the prescription is called in. Send Status: Choose the status of the selected prescription. Options include Unsent, InElectQueue, SentElect, Printed, Faxed, CalledIn, GaveScript, Pending. Clinic: Only shows if Clinics is enabled. Select the associated clinic. Click OK to save without printing. Click Print to save and print it to the default printer for single prescriptions (Printer Setup). To print multiple prescriptions on one page, see Rx Manage. The Rx sheet set as the default for the Rx sheet type will be used to print single prescriptions. See Sheet Def Defaults. Saved prescriptions will be added to the patient's Progress Notes in the Chart Module and to the patient's medication list. Prescriptions are not previewed before printing, thus they can not be digitally signed or changed before printing. To edit a prescription, double click it then reprint it. Below is an example of the print layout for the internal Rx sheet (one prescription printed per page). Note that the Generic Substitution Permitted check box in the internal sheet is always checked. To remove the check mark, customize the sheet. For preprinted forms, we recommend FormSource to have good service and reliability. See their Open Dental Health Care Form Price List. See also Vendors: Printing. Some offices may want to provide the patient with instructions separate from the prescription. In the Edit Rx window, enter the instructions in the Patient Instructions field, and Click Pat Instr. to print. Some states require an associated procedure show on their printed prescriptions. Each of the following steps must be completed to activate the preference. Enable the preference behavior. This preference is disabled by default. Check Procedure code required on some prescriptions to enable the subsequent preferences. Enable the preference for each Clinic. In the main menu, click Lists, Clinics, then double click to open the Clinic. Proc code required on Rx from this clinic to enable the preference on the clinic level. Enable the preference for each Rx template. This will check the Is Proc Required preference automatically in the Edit Rx window each time the drug is prescribed. Double-click the prescription to open the Edit Rx Template window. Check Is Proc Required for this drug. Enable the preference for an individual Rx. In the Chart module, click New Rx. Check Is Proc Required if it is not already enabled at the template level. Select a procedure from the dropdown, enter Days of Supply, and click Print. See Automation for options available when creating a prescription. Any time a prescription is created, edited, deleted, or printed, a log is created in the audit trail. Users must have the RxCreate security permission to create new prescriptions and the RxEdit permission to change or delete prescriptions. To view an audit trail of changes made to a selected prescription only, double click an existing prescription in the Progress Notes, then click Audit Trail on the Edit Rx window.